1. Pour some yellow paint into a paper plate. Dip a thumb into the paint and press it onto the black paper. Repeat for as many bees as you'd like. 2. Before the paint dries 'erase' the yellow paint in lines using a popsicle stick. 3. 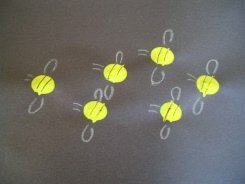 With a white crayon draw on wings and antennae for each bee.